Nearly 1 in 5 U.S. buyers use an FHA loan to finance a home purchase. The program’s popularity, in part, is because buyers can make down payments of just 3.5 percent via the FHA. But, there are other reasons why FHA loans are in demand, too. FHA home loans are mortgages insured by the Federal Housing Administration. 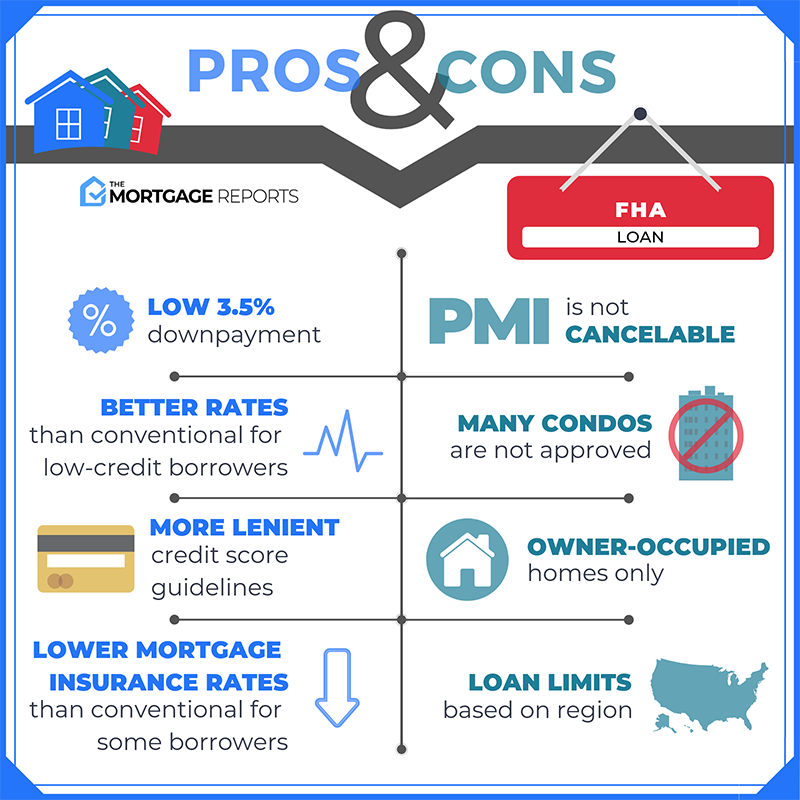 The FHA loan’s combination of low rates, low down payment, and flexible lending guidelines have made it one of most common loan choices for home buyers today. Also, you have ways to reduce what you’ll owe in FHA MIP annually including using a 15-year mortgage term for your loan; or, making a down payment of at least 5 percent. For today’s home buyers, there are only a few mortgage options which allow for down payments of five percent or less. The FHA is one of them. With an FHA mortgage, you can make a down payment as small as 3.5%. This benefits homebuyers who don’t have a lot of money saved up for down payment; and, home buyers who would rather save money for moving costs, emergency funds, or other needs. The FHA is aggressive with respect to gifts for down payment. Very few loans programs will allow your entire down payment for a home to come from a gift. The FHA will. Via the FHA, your entire 3.5% down payment can be a gift from parents or another relative, an employer, an approved charitable group, or a government homebuyer program. If you’re using a down payment gift, though, you’ll need to follow the process. FHA loans also allow higher debt-to-income ratios. Your debt-to-income ratio, or DTI, is calculated by comparing two things: your debt payments and your before-tax income. For instance, if you earn $5,000 a month and your debt payment total is $2,000, your DTI is 40 percent. Most conventional mortgage programs — those offered by Fannie Mae and Freddie Mac — allow debt-to-income ratios between 36 and 43 percent. With down payments of less than 25 percent, for example, Fannie Mae lets you go to 43 percent DTI for FICOs of 700 or higher. Mortgage software company Ellie Mae recently reported that the average DTI for closed conventional purchases was 34 percent. Officially, FHA maximum DTIs are as follows. 43% of gross income for housing costs plus other monthly obligations like credit cards, student loans, auto loans, etc. The average DTI for closed FHA purchases in was 41 percent according to Ellie Mae, and FHA will allow ratios as high as 50 percent. To get an approval at this high ratio, you’ll likely need one or more compensating factors — for instance, a great credit score, significant savings, or a down payment exceeding the minimum. Fannie Mae and Freddie Mac may say they accept FICOs as low as 620, but in reality, lenders impose higher minimums. These two agencies create guidelines by which lenders issue mortgages. But, banks and mortgage companies add their own rules on top of Fannie and Freddie requirements. The extra rules are called lender overlays. Stricter credit score minimums are part of the reason the average credit score for completed Fannie Mae and Freddie Mac home purchase loans was 754 in a recent report. According to the same report, by loan software company Ellie Mae, the average FICO for closed FHA purchases was almost 60 points lower at 686. FHA loan requirements allow for very low credit scores. About 37 percent of FHA approvals fell into the 650-699 credit score range according to Ellie Mae. Another 24 percent of applicants had a score between 600 and 649. The majority of Fannie Mae and Freddie Mac approvals went to applicants with FICOs 100 points higher, in the 700-749 group. High credit scores are great if you have them. But applicants with credit mistakes in their past can often purchase a home before they have fully restored their credit. What if an applicant has never had a credit account? Their credit report is, essentially, blank. FHA borrowers with no credit scores may also qualify for a mortgage. In fact, HUD prohibits FHA lenders from denying an application based solely on a borrower’s lack of credit history. The FHA allows borrowers to build non-traditional credit as an alternative to standard credit history. This can be a huge advantage to someone who’s never had credit scores due to a lack of credit history. Borrowers can use payment histories on items such as utility bills, cell phone bills, car insurance bills and apartment rent to build non-traditional credit. A little-known FHA benefit is that the agency will allow a home buyer to “assume” the existing FHA mortgage on the home being purchased. In a way, FHA allows you to purchase a rental property with 3.5 percent down. You have to choose a multi-unit property – a duplex, triplex, or fourplex – and live in one of the units. The rent from the other units can partially or even fully offset your mortgage payment. Conventional lenders will lend on investment homes with 15 percent down if you have excellent credit, income and assets. Use FHA financing to gain landlord experience with less risk and potentially more reward. Most mortgage programs limit their loan sizes, and many of these limits are tied to local housing prices. FHA mortgage limits are set by county or MSA (Metropolitan Statistical Area), and range from $314,827 to $726,525 for single-family residences in most parts of the country. Limits are higher in Alaska, Hawaii, the US Virgin Islands and Guam, and also for duplexes, triplexes and four-plexes. There are several government-backed and non-government (conventional) options that also offer low down payments and flexible underwriting. They include Fannie Mae and Freddie Mac (conforming) loans, HomeReadyTM and Home Possible® mortgages for low-to-moderate income borrowers, non-conforming loans, VA loans and USDA mortgages. FHA mortgage eligibility is not restricted to first-time or low-income buyers. Alternatives like VA mortgages are limited to eligible military and veteran applicants, and USDA loans have income restrictions and are available in less densely populated areas. Conforming and conventional loans often demand higher credit scores. No single mortgage program is best for all home buyers, so it’s smart to compare. The FHA Streamline Refinance is an exclusive FHA program which offers homeowners one of the simplest, quickest paths to a refinance. Via the FHA Streamline Refinance, there are no credit score checks, no income verifications, and home appraisals are waived completely. In addition, via the FHA Streamline Refinance, homeowners with a mortgage pre-dating June 2009 get access to reduced FHA mortgage insurance rates. At the time, the mortgage terms offered by lenders were onerous. To get a loan meant to make a 50% down payment; to agree to a loan term of 5 years or fewer; and, to make a large “balloon” payment to the bank after the mortgage’s first few years. The main feature of the FHA-backed mortgage was its Mortgage Insurance Premium (MIP) program, a self-sufficient insurance fund through which the FHA could ensure the nation’s lenders against “bad loans”. In time, the FHA MIP system gave banks confidence to make better loans with better terms for hopeful U.S. home buyers. Soon, the down payment requirements for a home loan dropped; 5-year loan terms were replaced with longer terms of 15 and 30 years, and mortgage rates dropped.